Prevents and deactivates corrosion on metals. Safely lubricates and penetrates mechanisms. ACF-50 .. Intensive quick cleaner, residue-free and rapid evaporation, for cleaning and degreasing mechanical ..
Advanced Freeze Formula Low Surface Tension Penetrates - Lubricates - Protects Easy free ice will..
Electrical degreaser is a highly efficient general purpose cleaning solvent. It is ideal for thr re..
Soudafoam confort is a one component expanding polyurethane foam. It is comfortable and very easy to..
Quick Setting Can be Cut, Sawn and Plastered in 1 Hour Yields up to 50 Times Can Contents Fills I..
Firefoam B2 is quick setting Fire Resistant for up to 2 hours. Expands on Application up to 50 tim..
Food Grade Food Safe Lube NSF Registered Food Safe Lube is a very high quality H1 Lubricant Spray ..
Zinc Spray for professionals. The used zinc and zinc compounds contain more than 99% high purity zi..
High Zinc content providing High Corrosion Resistance and Excellent Weld through Properties. Used i..
Gasket Remover is a new Highly Active Aerosol Paint Stripper Developed for Fast, Clean, Efficient, P..
Light adhesive spray grease forms a lubricating film with corrosion protection, is abrasion resistan.. Ideal for use in a wide range of industries including electrical,moulding, transport, automotive, en.. Rapidly frees rust & corroded parts. Acts quickly and softens rust and corrosion deposits. Displac.. 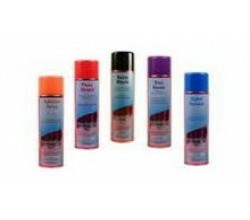 The silicone spray is a universal lubricant and grease. It is waterproof, weatherproof and temperat..
Colourless, Odourless non-Staining A Universal Release and Lubricating Agent which is Temperature S.. Safe on Rubber & Plastic Wide Temperature Range Stays Viscous & will not Harden. Specially formul..